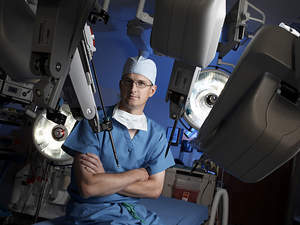 MADISON, WI--(Marketwire - November 20, 2008) - Surgeons at St. Mary's Hospital will perform a live minimally invasive robot-assisted prostatectomy surgery for treating prostate cancer using a da Vinci® Surgical System on www.OR-Live.com. The da Vinci® is the most innovative surgical option available to treat prostate cancer. Using the da Vinci® Surgical System, this prostate-removal procedure brings even more credibility to the term "minimally invasive surgery." It requires five tiny incisions through which the surgeon operates, via remotely controlled robotic arms with tiny 8-millimeter instruments. Smaller incisions mean less trauma to the body and faster recovery. Use of the da Vinci system has also been shown to yield shorter hospital stays, less pain and superior clinical outcomes. The prostatectomy will be performed by Dr. Brooke Johnson, Dean Health System urologist, and physician assistant Megan Kushner. Dr. Adam Tierney, Dean Health System urologist, will provide commentary. The webcast will be hosted by Steve Van Dinter, Regional Director of Media Relations & Public Affairs for SSM Health Care of Wisconsin. Join us to learn more about this fascinating surgical option that also has applications in gynecologic procedures and heart surgeries. Visit OR-Live.com.